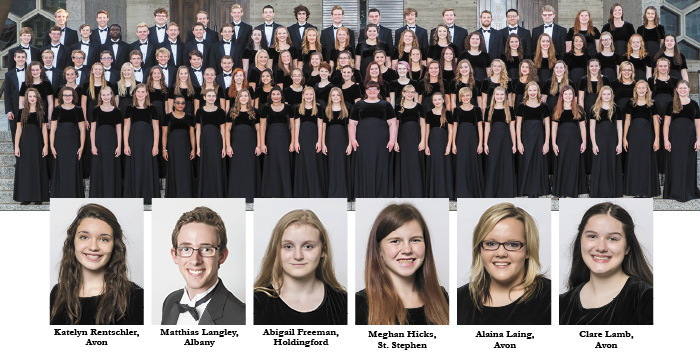 A group of high school students from Albany, Avon, Holdingford and the surrounding areas will be performing “Requiem for the Living” at the Paramount Theatre in St. Cloud on April 21 at 7:30 p.m. and April 23 at 3 p.m., as part of the Youth Chorale of Central Minnesota (YCCM). Founded in 2005, the YCCM is a non-profit chorus for students in ninth through 12th grade. Students from central Minnesota, who are highly passionate about music, both instrumentally and vocally, can audition to become part of the group. Artistic director and founder of YCCM, Garrett Lathe, holds auditions every May. Each of the over 100 high school singers from 27 cities and 23 high schools have auditioned and earned their place within the organization. Among the students who have proudly taken their position within YCCM include Alaina Laing, Clare Lamb and Katelyn Rentchler, all from Avon; Matthias Langley from Albany; Abigail Freeman from Holdingford; and Hicks from St. Stephen. Johnson produces all the bookings at the Paramount. She approached the YCCM coordinator two years ago after going to a high school choral concert. She was disappointed that local high schools no longer have student choir groups present large works – oratorios, “Messiah,” requiems and more – the kind of works that are at least 30 minutes long and take much of the year to prepare and are accompanied by large orchestras. Hicks, daughter of Wendy and Patrick Hicks, joined at the age of 15 after hearing about the group from her choir teacher. She will be singing first alto for the “Requiem” piece. Laing, 17, another member of the YCCM, auditioned in 2016 and sings soprano, occasionally alto, depending on the song. She has devoted much of her life to singing, whether it is in church or YCCM, listening to music, playing piano or guitar. Singers perform six to eight times a year with well-known performing arts groups such as the St. John’s Boys Choir, Cantabile Girls Choir, St. Cloud State Concert Choir, Great River Chorale, Minnesota Center Chorale, Kantorei, The Singers, and From Age to Age. “My favorite experience this year in YCCM was when our group, Con Brio, went to Duluth and worked with choirs in the area. I became good friends with the other girls throughout that trip,” Laing said. “My favorite experience with YCCM so far was when we went up to Duluth for a clinic,” said Lamb, an Alto II singer. Lamb, daughter of Mike Lamb and Maureen Graham, joined YCCM at the age of 14 in 2015. Lamb found out about YCCM when she was a child because her brothers were a part of the group. “I had been going to YCCM concerts for years before I was even old enough to audition,” she said. The Youth Chorale performs a diverse range of choral literature, from Renaissance masterpieces to commissioning new music every year. Past commissions have included Paul Brandvik, Matthew Culloton, Abbie Betinis, Eric Barnum, René Clausen, Dale Warland, Timothy Takach, Timothy Tharaldson and Jocelyn Hagen. Each of the students in the group drive to rehearsal Sunday evenings for two hours on the campus of St. John’s University, to practice for the upcoming concert. Lamb is equally excited about each practice to see each individual piece fit together on performance day. “YCCM is a priceless group because it has the power to bring high school singers from central Minnesota together to enjoy music.” Lamb said. Johnson and Lathe believe singing and music in general is not only important but also crucial for youth to participate in and thrive in their passion and talents. For more information on YCCM and their performance visit www.youthchorale.org.